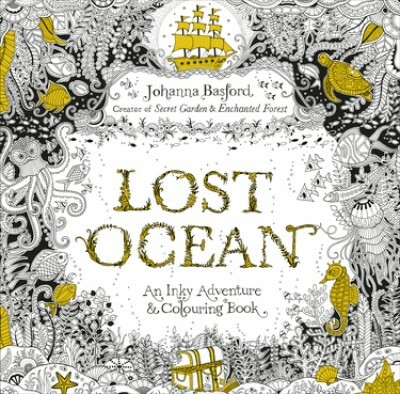 A beautiful new colouring book that takes you on a magical journey beneath the waves, from the creator of the worldwide bestsellers, Secret Garden and Enchanted Forest. Also features a large double-sided pull-out poster to colour and keep. With Lost Ocean, Johanna Basford invites colour-inners of all ages to discover an enchanting underwater world hidden within the depths of the sea. With intricate pen and ink illustrations to complete, colour and embellish, readers will meet shoals of exotic fish, curious octopuses and delicately penned seahorses, visit coral reefs and barnacle-studded shipwrecks, and discover intricate shells and pirate treasure. Secret Garden and Enchanted Forest fans and newcomers alike will delight in this creative journey into an inky new world. For Lost Ocean Johanna picked a crisp ivory paper that accentuates and complements your chosen colour palette. The smooth, untextured pages allows for beautiful blending or gradient techniques with coloured pencils, or are perfect for pens, allowing the nib to glide evenly over the surface without feathering.